You guys! I am beyond excited about this. 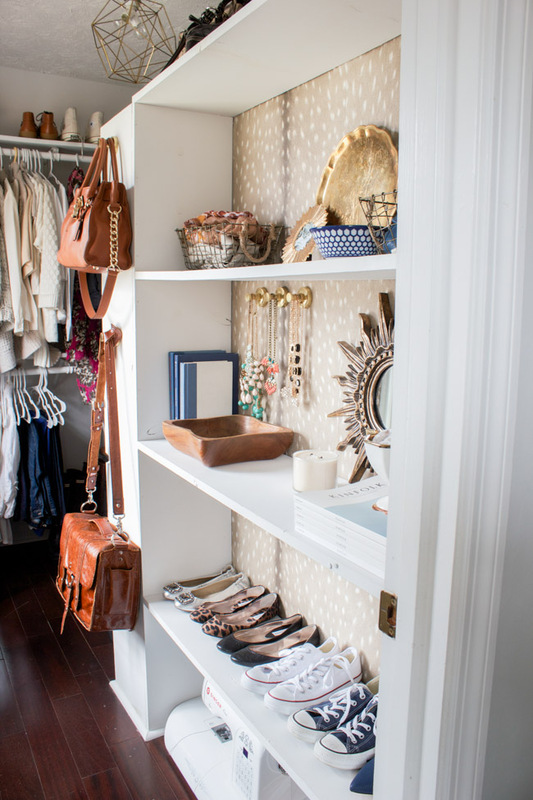 As I recently showed you, I added this fawn wallpaper to our master bedroom closet (you can see the makeover reveal here) and I am in love with it. It’s glam and feminine and basically everything my husband hates, but it’s the closet, ya know? I think it’s a decent compromise since I didn’t force our house to ooze femininity at every turn. The closet (or at least my half of it) was fair game as far as I’m concerned. Anyway, I loved the wallpaper but I sort of hate the whole wallpaper removal process, and I change my mind a lot. (I have what is commonly referred to as decorating ADHD.) 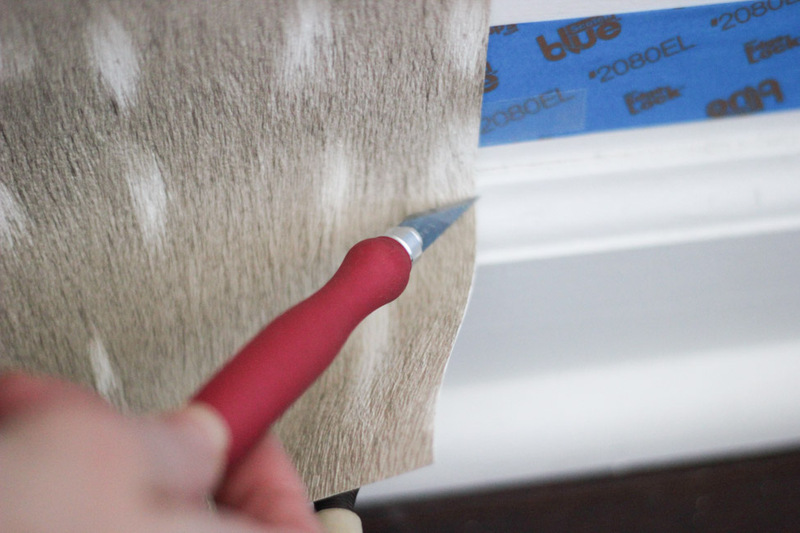 So I set out to find out how to make wallpaper removable, so that I could hang the exact wallpaper I wanted without using glue or making it permanent. And I found a way! I had heard about this idea suggested in an old Lonny Magazine article a long time ago and always had it in the back of my mind, wondering if it would actually work. 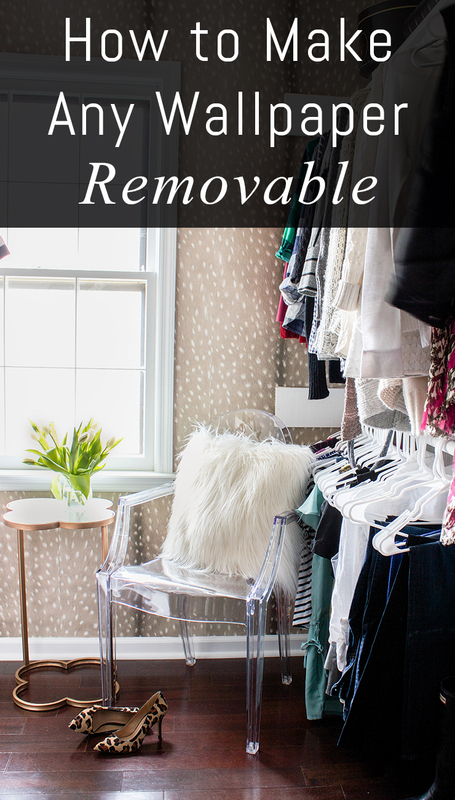 Yes, removable wallpaper exists, but the pattern choices are limited, and this method allowed me to use any wallpaper I wanted. I have to say, this was a total experiment, but I’m so happy that it worked. I’ve used thumbtacks to attach wallpaper to the backs of bookcases, and I’ve used just plain old double stick tape too, both of which can work depending on the situation. However, the method I’m sharing with you today requires no glue, no tacks, no holes, no wall damage, period. Here’s what you’ll need. Double Sided Tape (Amount will also vary, but you will need A LOT.) I suggest shopping Amazon to find it in bulk, or check out the dollar store. I used a couple of different types based on whatever I could find at the store. 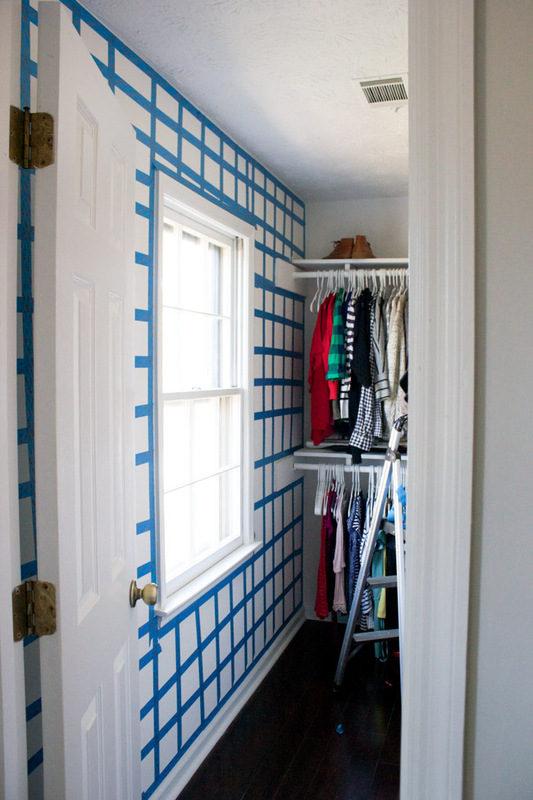 First, create a grid on the wall with painter’s tape. This doesn’t have to be perfect by any means. Just slap the tape up there in a general grid formation—no measuring or straight lines necessary. 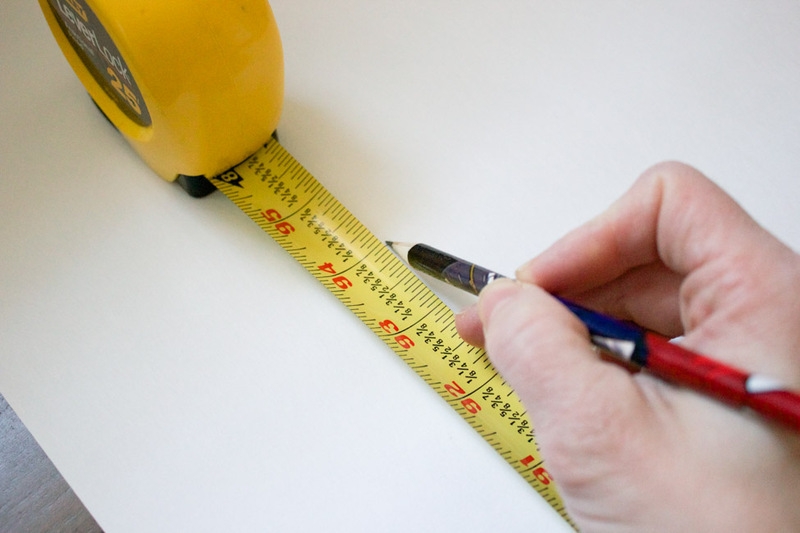 Next, measure your wall and then cut a strip of wallpaper to the correct length, leaving a few excess inches. Set aside. 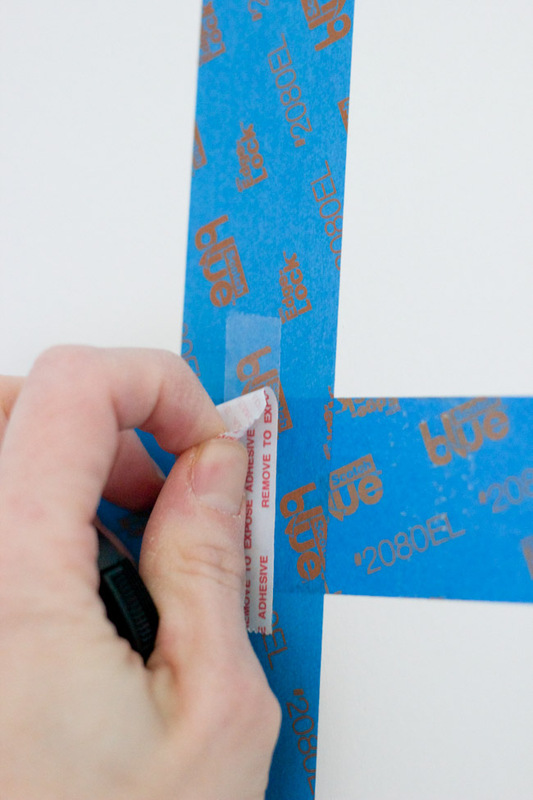 Apply double-sided tape on top of the painter’s tape. This provides a barrier between the double sided tape and the wall, so that removing it will not damage the wall later on. If you stick the double sided tape directly onto the wall, it will damage it when you pull it off. Work in sections, applying the tape just to the area where the first strip of wallpaper will adhere. Carefully position your first strip of wallpaper onto the wall, smoothing it out as you go. You may need to go in and add additional pieces of painter’s tape with more double sided tape on top as you go, especially under edges to make them less noticeable. When you get your wallpaper positioned on the wall, use your X-Acto knife to cut the excess paper off the top and bottom. Repeat the process, carefully matching up the pattern repeat on your paper (if there is one), all the way around the room. If any edges are not laying flat, stick some more tape under them until everything looks smooth and uniform. Then step back and enjoy your hard work! This is time consuming and a little bit tedious, but not difficult and definitely worth it if you don’t want to worry about having difficulty removing it later. This will peel right off whenever you want to change up your decor. The most difficult part was applying the wallpaper around the window, but I just tried my best to smooth it and slowly cut it with the X-Acto. I’m sure this is the case regardless of application process. 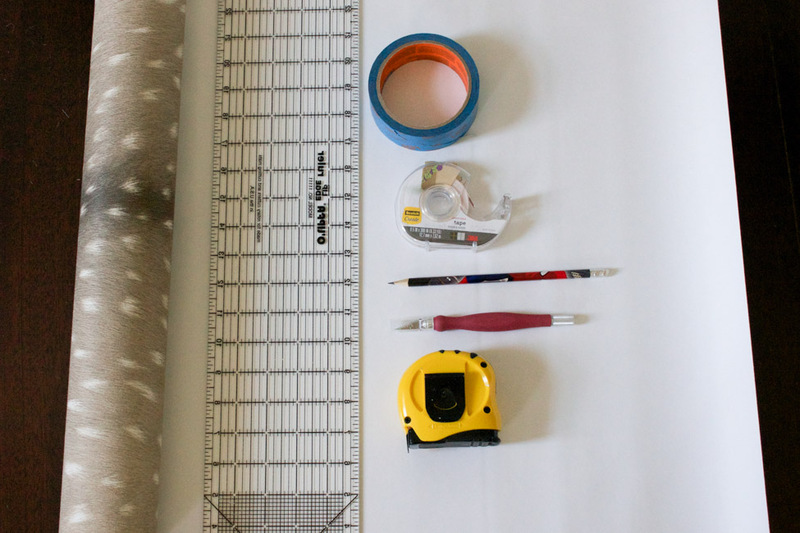 If you’re covering a lot of wall space, I would make your grid quite large (to save both time and tape) and pay special attention mostly just to the edges. I found that that’s where I ended up needing the most tape anyway. I used the same method for behind the shelves too. Do you have a favorite wallpaper hanging tip? I’d love to hear about it! Disclosure: This post contains affiliate links. I received the wallpaper for free from Walls Republic. All opinions are my own. That is genius. I love that idea. Thank you Marty! I was just so happy that it actually worked! Thank you so much, Charlotte! I was a little bit shocked that it actually worked. Haha! Thank you, Alexis! I was pleasantly surprised that this method actually worked! such a smart idea! and i just adore the look! This is absolutely brilliant! Especially the layer of painter’s tape to prevent damage to the wall – I would have NEVER thought of that! And of course, the wallpaper itself is absolutely stunning! I hadn’t heard of this technique before but will definitely be saving in my design files. Thanks for sharing Erin. I NEED to do this, I am dying for pattern over here in my rental! Thanks girl! This is a great post! I am going to be saving this one for future reference! Thank you for sharing at The DIY Collective! And, I LOVE the fawn wallpaper and all of the other touches of feminine in the closet space- absolutely stunning! I would like to find the ‘faun’ wallpaper. Can you help me with sourcing this paper? Thank you….I love this idea and will use it for a mural that my grandaughter wants. Hi Nancy. The wallpaper came from Walls Republic. Wow! Genius! Most folks don’t wallpaper cause they don’t want to have to remove it eventually! Thank you, Sue! That’s definitely how I feel about it. Removal is a pain, but I love the look of it. Glad to have found a compromise! Oh my husband will be so happy to know that I can wallpaper every room of the house now! lol. Thank you so much for sharing with us at Merry Monday! Yes! You totally can. Haha. Thanks, Amanda! Thanks so much, Mary! I would love to hear about it if you try it! Your closet is gorgeous!!!! 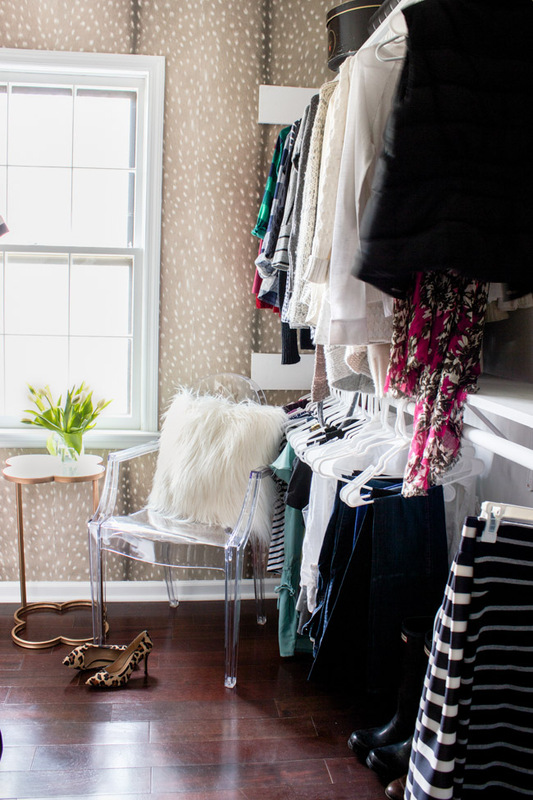 I love the wallpaper and it is perfect for your closet. Great tutorial. Pinning and sharing. Awesome idea! Does this make the wallpaper reusable or would it get ruined when removing! Thx for this post! Good question, Kerianne! I’m really not sure since I haven’t tried to remove it, but my guess is that it should work. As long as you use heavy duty, good quality wallpaper and peel it off slowly and carefully, I think you could reuse it. Do you know if this will work over existing wall paper? We may be moving into an apartment with “not so attractive” wall paper in the kitchen and wanted to try! Hi Sarah! I would imagine that it should work, but I would test a small area first just to make sure the painter’s tape doesn’t mess up the wallpaper when you peel it off. Good luck! Hi! I just was wondering how well this has held up for you. Is there any peeling and such? Thanks in advance! Great question, and thanks for the reminder that I need to add an update! There is some peeling from time to time, and I just press it back down as I walk by. I think if I did it over again, I would add a tighter grid and more tape. And I don’t think I would do a whole room, but an accent wall is the way to go! This is brilliant!! I’m so glad you shared! I’m for sure doing this in my living room!! What a great idea!! Thanks for sharing! I am wondering how this held up for you as the seasons changed from cold to hot? Was there any significant peeling? Thanks again! It did peel some, and I just press it back down as needed. I think, to do it over again, I would add more tape. For a closet it’s fine as I can just press it down as I walk by sometimes. Not sure if I would do an entire room though. I love this idea and I’m about to do it myself. Does it stick okay with regular double sided tape? Or do I need something stronger? It has peeled some, so if I did it over again I would definitely add more. If you can find something a little bit more heavy-duty, I would go with that! Will the painters tape damage wall paint if left on for a number of years? I would think it would take many years for that to happen, but if it does you can always just repaint. One of the strips did fall down but I think it’s because I didn’t put enough double stick tape behind it. I would just put a TON. Good luck! Thanks, Rebecca! Glad you found this helpful. Good question! I think if you removed it very slowly and carefully, it could be salvaged. Haha! Thank you! I’m glad you found it helpful. I suspect you could also apply painters tape to the paper to help salvage it too, if you really wanted to. My question, though; Would this method be a disaster in a bathroom? I suspect with all the moisture and humidity I would be better to actually just apply it the proper way. Thoughts? Yes I definitely wouldn’t recommend it for a bathroom. I think the humidity would make it peel off pretty quickly. I was searching for a way to do wallpaper behind my Christmas theme Mantle without ruining the drywall and your idea rocks!!!! You are now in my Genius Club!!! It turned out great! Thank you for sharing!!! Hi Erin! How do you know this worked? 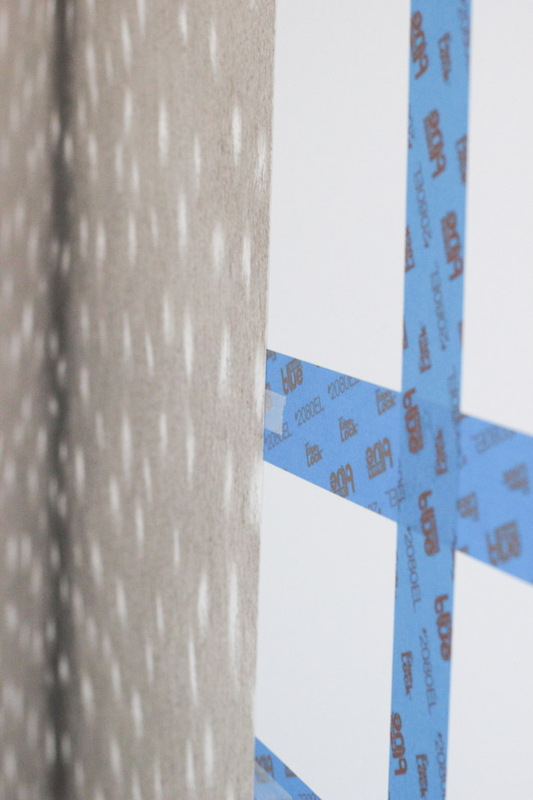 Did you test double-sided tape on the wall for a few weeks and then remove to see if it damaged the paint? Or, are you only referring to the fact that it held it to the wall when you say, “it worked.” I’ve read some articles online that say painters tape can damage the wall is left on for more than 24 hours. in the future, for these types of tutorials, would be helpful to show us to take down as well. Maybe do a wall in your home that you don’t plan to leave the wallpaper on, leave it up for a few weeks, and then show us the after photo. Thanks! @Jasmine – valid concern, but were those articles specifically saying that the wall will be damaged or that it’s bad to leave it too long when you are actually in the process of painting the walls? Because the latter is a thing, as you risk taking some of that new paint off with the tape if you leave it on for too long. Would this work for Kitchen cabinets?! We are renting and our kitchen cabinets are hideous. Would love a temporary solution! I probably wouldn’t do this in a space with a lot of moisture or humidity.